When I first learned the technique I was "touch averse" and the idea of it made me anxious. But I deeply desired to help others and understand the oils and their power in as many ways as I could. It took me about 2 years to get comfortable with the technique (because I hesitated to offer it!) Once I experienced the incredible relief it gave to my friend, I saw opportunities everywhere to be a blessing. We can't fix others life challenges, but we can offer comfort, ease, hope and help. And the loving touch of our hands and support of the oils is a POWERFUL way to do that. I've become addicted to sharing it because it makes both the giver and receiver feel wonderful. I keep the oils in a little keychain so I'm always prepared! Because of the specific oils chosen, their order, and movements of the technique, we can help a person dealing with health issues or trauma to come to a space of relaxation and support the body in continuing its work of restoration and recovery. The beauty of the technique is that it can be learned in just one day and you do not have to be an expert on what their body or emotions need to be able to help. This empowers ALL of us to contribute to the wellness of someone we care about. With a background in massage therapy I have long known the benefits of touch. I have been fortunate enough to be able to positively affect so many people’s lives with therapeutic massage as well as hands-off reiki. 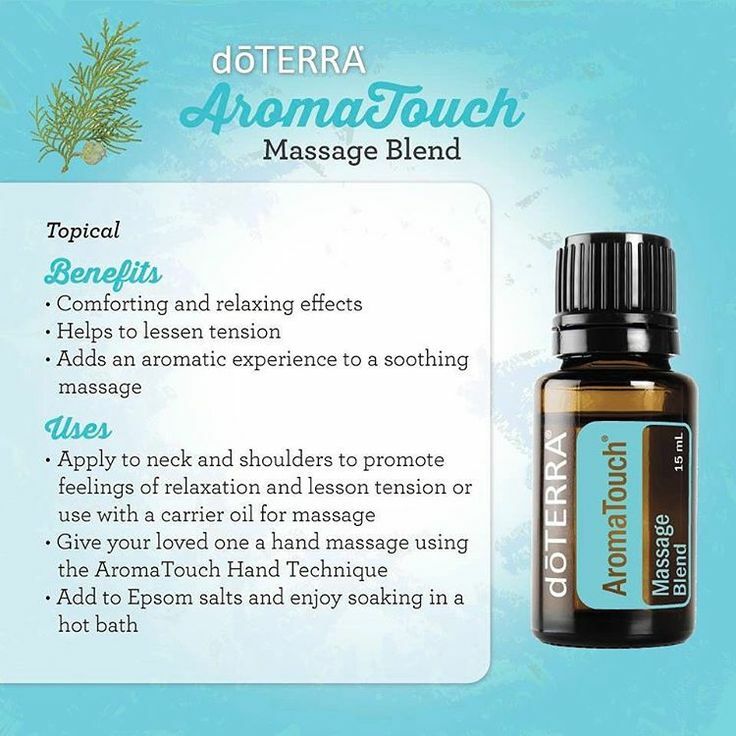 Stress relief through therapeutic touch is so important to our physical bodies and minds and DoTERRA has developed an easy way to help us reduce stress while enjoying the benefits of essential oils and touch. Last year I trained with Dawn Behm, Diamond DoTERRA Wellness Advocate, who taught me how to perform DoTERRA’s Aromatouch Technique. Learning how to do this has been life changing, not only for me and my family and friends, but for my clients too. You don’t need to have a massage/bodywork qualification to perform the Aromatouch on family and friends. This is what makes it so accessible and cost effective. All you need are the oils, a massage table and a willing participant! For everyone, it's a beautiful way to learn a new skill that is simple and profound. You will understand the power of essential oils better. You will be skilled and prepared to offer help and comfort in almost any situation. In addition to the education, you receive $100 worth of oils AND get an Aromatouch! What a win! Most people leave the training feeling like they've just had an amazing day at the spa. It's a no-brainer and gift to yourself as well. I HIGHLY recommend it! Some examples of situations I've seen the Aromatouch rock are: bonding with my daughter, comforting grieving family members, honoring my doTERRA business partners, thanking my customers and helping them experience oils, calming anxious, hyper children, soothing elderly loved ones, bringing relief to friends with injuries and recovering from travel challenges. If you are building a doTERRA business or are a massage practitioner, the training makes even more sense as it is one more way to care for clients and build. Some offer Aromatouches to invite non-members to experience oils, some offer it as a customer appreciation gift. However you decide to use it, the investment in time, education, experience and oils you receive in a training will pay dividends for decades to come. Every day we have opportunities to make life better for others. This technique and 8 precious oils are empowering!! Join us at an Aromatouch Training, a Meditation Circle or Essential Wellness offering near you. Wish there was an event near you? Reach out to see if we can make it happen. “Thank you Dawn for the incredible experience. I loved the days after - my body felt incredible and when I did the Aromatouch on my husband Saturday night he said it was the most relaxing experience ever and the best sleep he has had.